By the end of China's Bronze Age, sophisticated vessels were made for preparing and serving sacrificial food and wine. As the most precious possessions- emblems of sovereignty, prestige, wealth, and power- such bronzes were buried with the dead. The clarity of design and architectonic shape of this ritual wine container result from the uniquely Chinese piece-mold method of casting that produced it. After the design was carved in reverse into clay molds, molten metal was poured into the assembled sections. The bronze worker exploited the technique for artistic ends to produce in the finished work three-dimensional ridges cast by the joins between the mold sections and finely wrought ornament that retain an overall segmented effect. 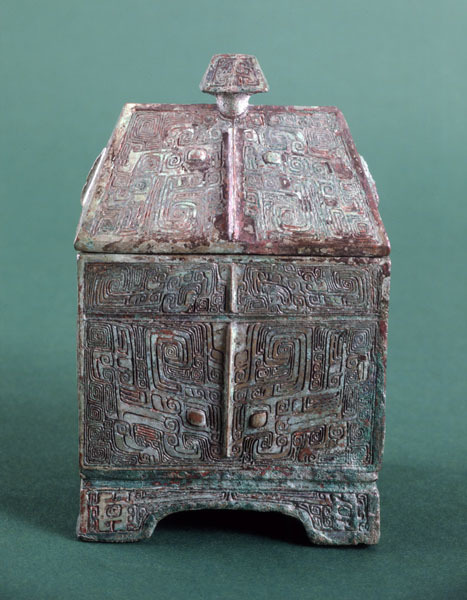 Bilaterally symmetrical masklike designs with protruding eyes (taotie), the dominant Shang decorative motif, appear on each side of the vessel and the front and back of its roof. Birds, snakes, and a squared spiral (lei wen) covering the ground complete the decor. The fact of the container's use in ritual suggests that its ornamentation had meaning, but no specific interpretation can be advanced. The inscription is probably a clan name.